I’ve just done something that I have always said I would never, ever do. Its something that I always dismissed as being for people made of tougher stuff than me – those with nerves of steel and guts to match. Adrenalin junkies, extreme sportsmen, mad people, call them whatever. But certainly not me. For me, it’s a seemingly death-defying act that appears to push the boundaries between life and mortality to a limit that I’m just not prepared to take. I like being in control of my own fate and my own destiny too much to put my life, my future and my beating heart in the hands of a glorified elastic band. 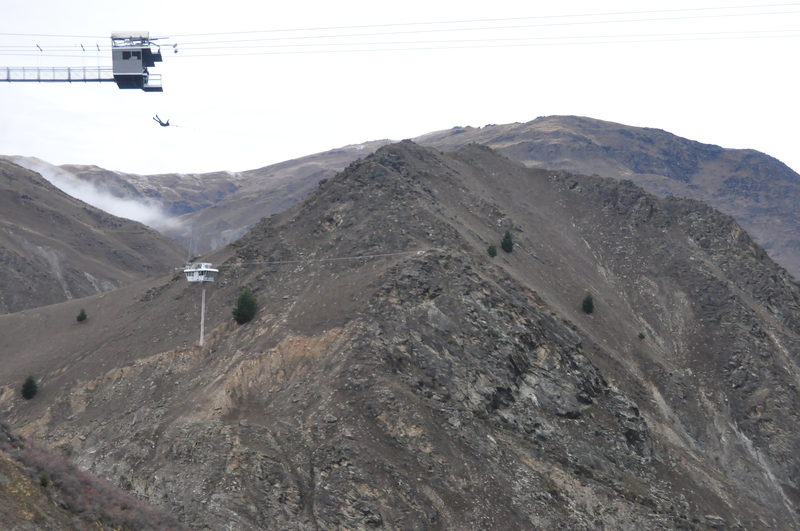 And then along came Queenstown, the adrenaline capital of the world. A place where fun, excitement and exhilaration is the order of the day. 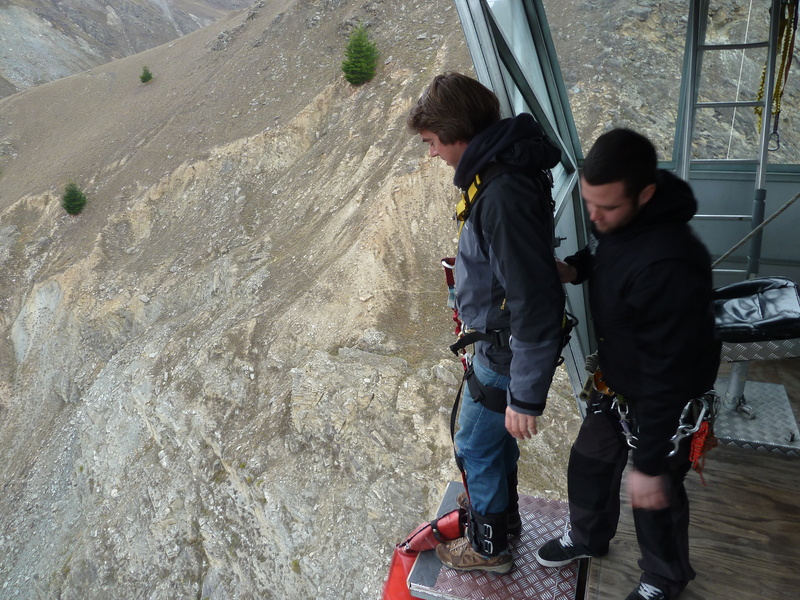 A place where, for reasons I am yet to understand, I thought it would be perfectly normal to throw myself from a suspended gondola and dive head first into a canyon. I introduce the AJ Hackett Nevis Bungy. Yep, that little blob is me! At this stage, I need to supply a few facts as this isn’t your average jump from a crane in a backstreet pub carpark. 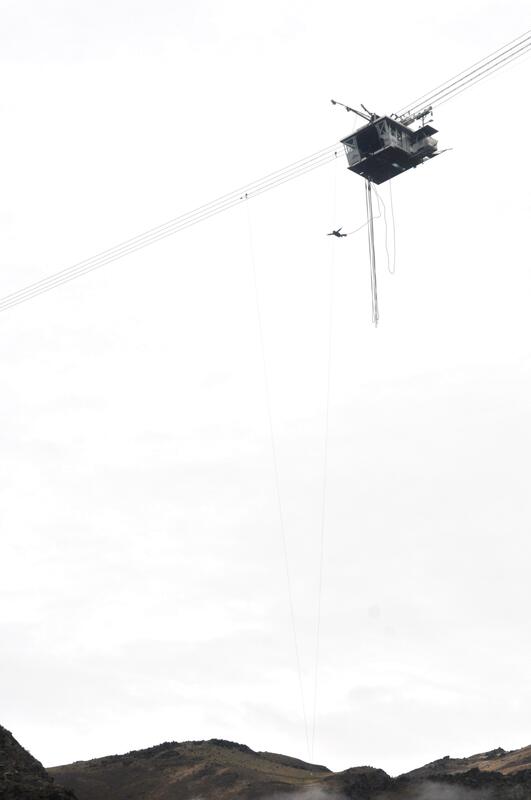 This is the real deal – the birthplace of the bungy, the home of the pioneers of the sport, and a 134 metre drop over the Nevis River that flows below a purpose built bungy pod. 134 metres. 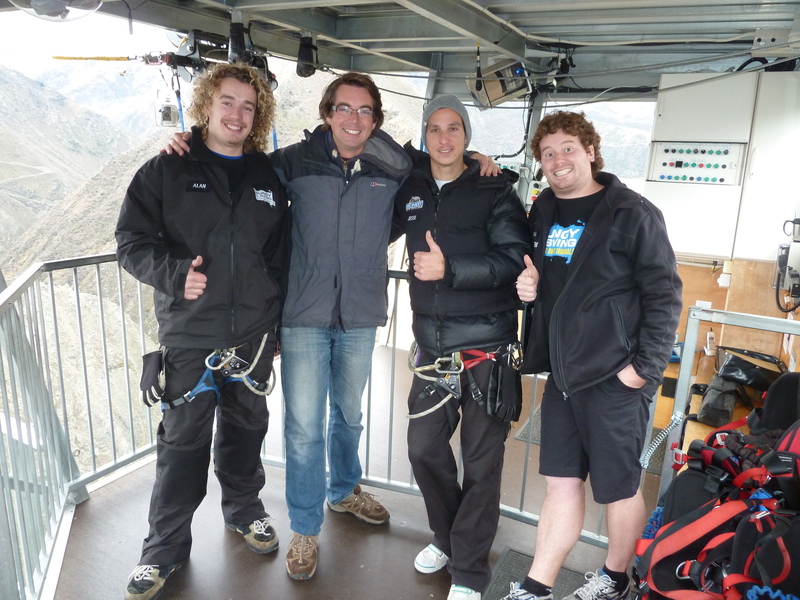 The highest bungy jump inAustralasia, and for that matter, one of the highest in the world. It’s a figure I have been torturing myself with over the past day or so. 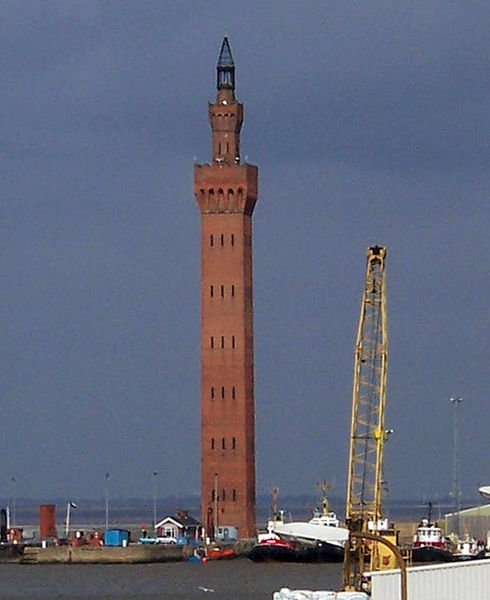 Grimsby Dock Tower, visible for miles around Lincolnshire, is only 94 metres tall. Add almost half again and its about the same distance that you drop. The Humber Bridge towers reach a height of 155 metres – I have been up them, and can’t imagine the thought of throwing myself from something that height. I spent most of this morning with my stomach churning with nerves. On top, my head was pounding from a night out with my Magic Bus group. 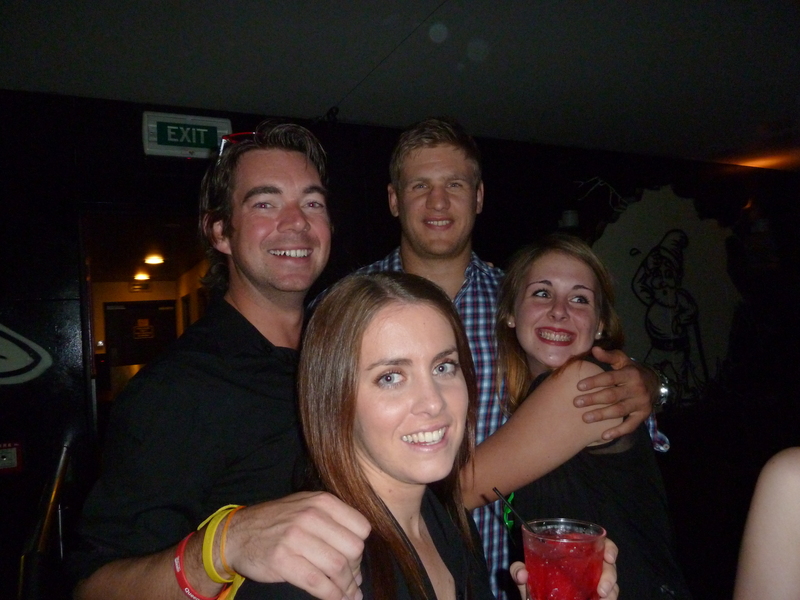 Our driver Soap had given us a Queenstown party to remember. Even the Irish rugby team turned up to join in the fun after their dramatic last minute loss against the All Blacks 24 hours ago. It was, most definitely, a night to remember. There will be more about that in a future post, however – with a lot planned this week, I’m taking a break from the chronological norm and hoping to document my time in the adventure centre of New Zealand day by day. 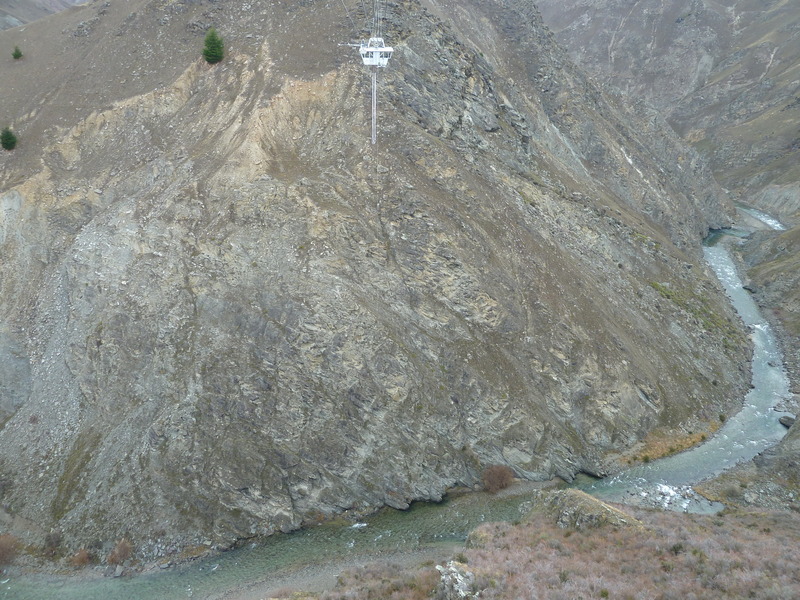 So how, after being so resolutely against doing any kind of bungy jump in my lifetime, have I ended up on my way to the mountains so I can throw myself towards a river from a ridiculous height? 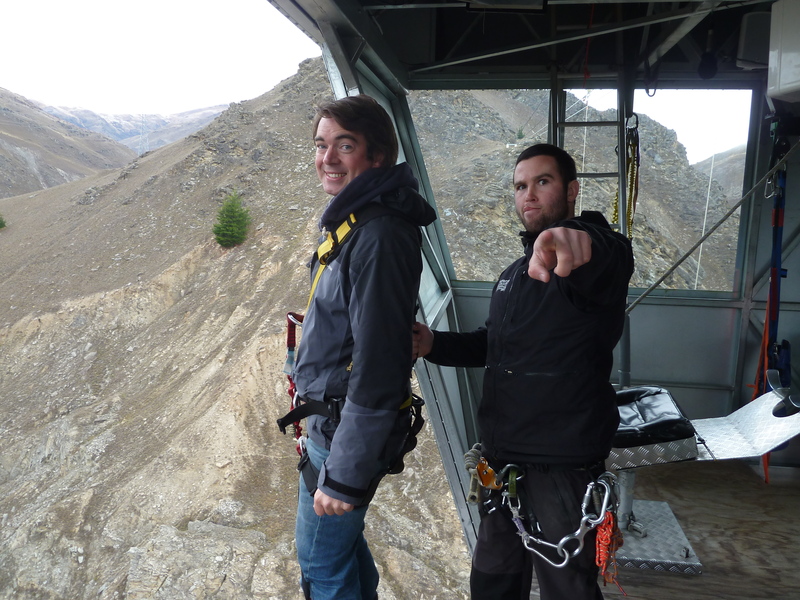 It all started when my bus tour visited the Kawarau Bridge Bungy, the place where bungy jumping all began. 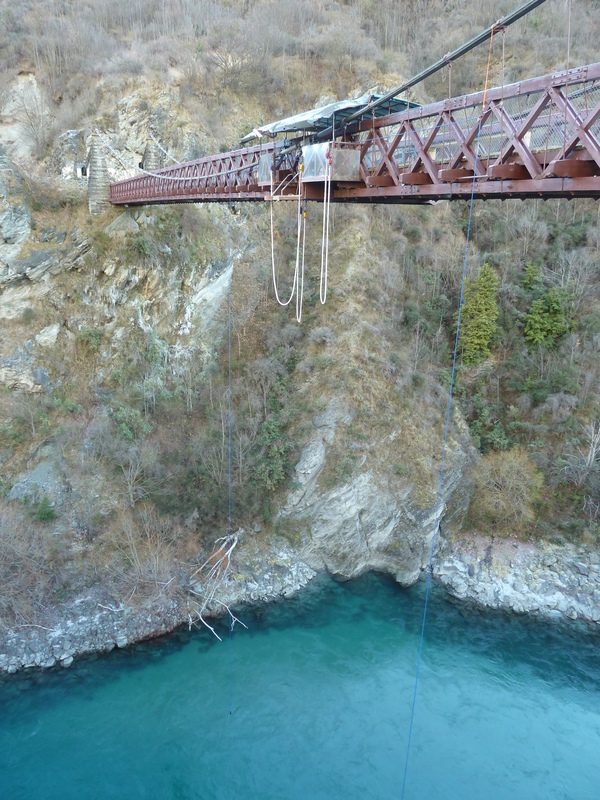 Its home to the original 43 metre bungy jump that was to become the first commercial jump in the world, thanks to two Kiwis who met while skiing in a nearby resort. Their names were Alan John (AJ) Hackett and Henry van Ash. Inspired by watching ‘land diving’ by people on the islands of Vanuatu, they developed the stretchy latex rubber chord that was named the Bungy, after the stretchy bands that were often used to strap items to the roof of a car. After some high profile leaps from landmarks such as the Eiffel Tower in Paris, they demonstrated that their newfound sport, and chords, were safe. Their leap of faith spawned an activity that is now going from strength to strength, and watching the video of jumps over the years, and hearing how safe and enjoyable the leap towards ground can be, my mind started to wander. Perhaps it would be quite good to do one. 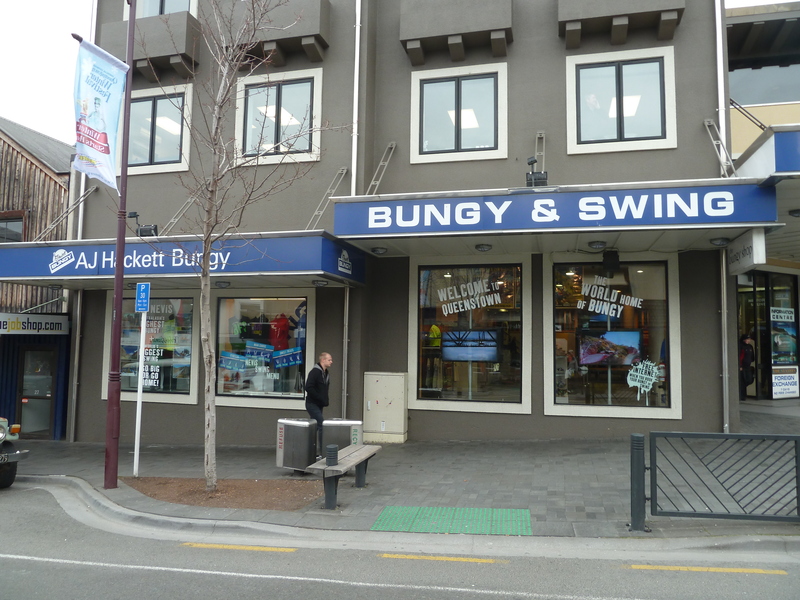 After all, Queenstown is the home of the bungy. I might only ever be here once – I might leave having had an opportunity to do a jump with the company that invented it, right at the sport’s birthplace, and regret it when I’m back home. And I hate that nagging ‘I wish I had’ thought. Checking into the Base hostel in the town, there was a sign on a wall. It says you’re not allowed to leave Queenstown without having done something crazy to write home about. My decision was made. And so I made my way to check in at the offices in the town centre, butterflies in my stomach and already feeling nauseous. In the back of my mind, that awful thought of ‘what if’. What if the chord snaps? What if there’s a problem with the harness? What if I’m that one statistic for whom it all went wrong. The prospect of a terrifying few seconds of realising my time is up before gravity and a rocky riverbed colluded to do their worst. Its all part of the fear, facing up to your own mortality and wondering, as I prepared to leave my hostel, whether it could be the last time I’ll experience the warm spray of a shower or the minty freshness of brushing my teeth. I guess these thoughts are part of the reason why the human species puts itself through such incredible extremes for a thrill. There’s always a chance something can go wrong, and yes its frightening, but the sense of achievement and the rush of adrenaline will always outstrip those nervewracking concerns. I’d not eaten, and I didn’t feel hungry, but knew I should get something. Afterall, it might be the last time I experience it. It might possibly be my last supper. So what did I go for? Why, the McDonalds loose change menu of course, but for once I struggled to eat the double cheeseburger. My nerves were definitely getting the better of me. I arrived at the AJ Hackett check-in centre, where the friendly and reassuring staff told me it was completely normal to feel exactly how I quite clearly looked. I was finding it difficult to speak properly, my mind racing away in my head, as I signed the disclaimer. 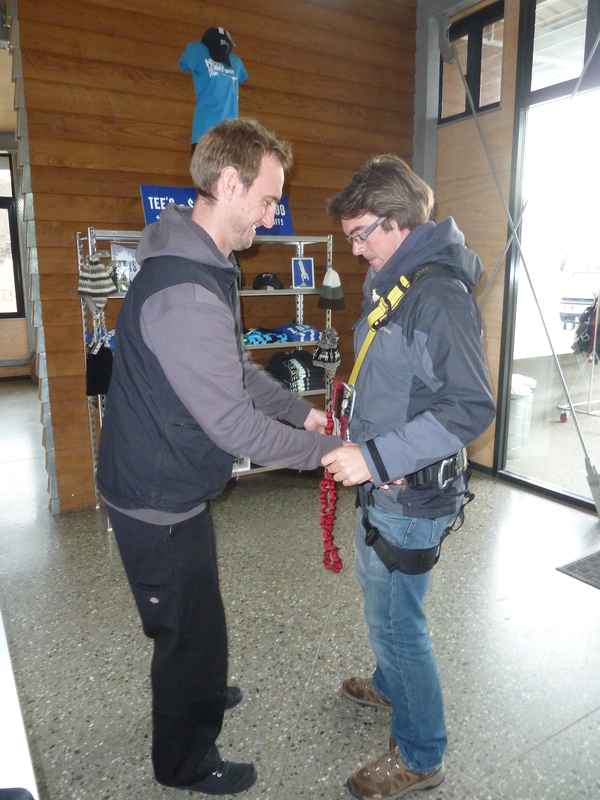 I was weighed, my 85kg bulk being an important factor in the choice of bungy chord. My hand was covered in permanent marker with numbers and codes for the jump and photos. 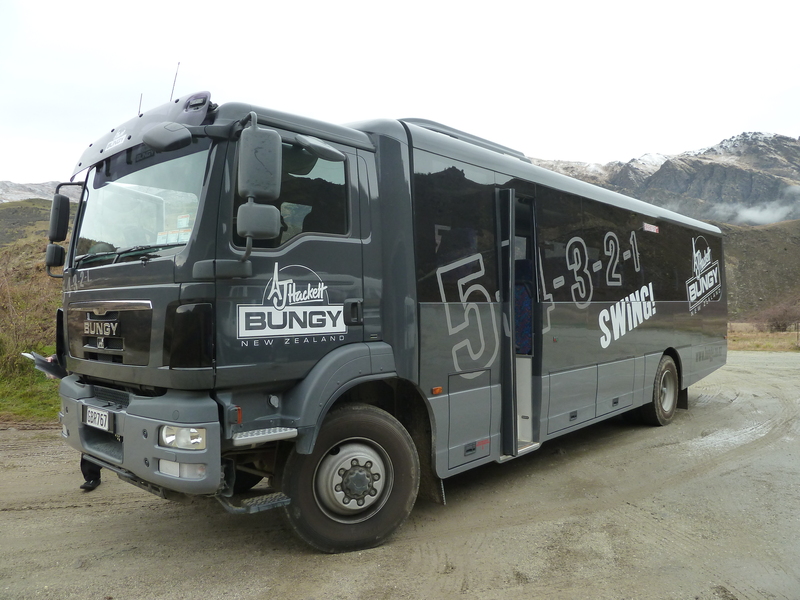 I have also been put forward for a bungy swing, taking the sport to another level by introducing the largest swing in the world to the area. Before long, I’m being called to the special 4×4 bus that will take me to the jump site. There’s a Dutch guy called Dennis, also heading to the Nevis Bungy. He’s equally as nervous as me. There was little conversation as we both watched the mountains gliding by the window, before we turned off the main road and headed up a dusty, rocky track. Above it, my first glimpse of the high wire and pod. My fears reach another level. “First jump bro?” asks one of the assistants at the reception building on top of the mountain. ‘Yes’ I nervously nod back, sucking air between my teeth as I look through the windows and see the suspended jump pod swaying slightly in the breeze. “You’ll be fine mate,” came the reply as he pulled out a harness and asked me to pull it up and around my legs. I look at the mass of buckles, clips and straps and know that my life, in a few minutes time, will depend on them. We walk outside and I get my first proper look at the jump – and of the horrifying height we’re at over the fast flowing Nevis River below. The third highest jumping platform in the world, built at a cost of some $1.5-million, is suspended by high tension cables in front of me. I’m given a briefing about how to jump and how to prepare for recovery. At this point, the thought of coming back up couldn’t be further from my mind – the prospect of stepping out into the emptiness below me is still the big one that occupies my brain. It is joined by a fleeting, morbid thought that this could be where I meet my end. After all, I’ve seen those videos where the bungy chord snaps. I try to channel those thoughts and images out. I’m ushered towards the basket transporter to the platform. It starts out slow, leaving the cliff and mountain behind, the land quickly falling away below me. The adverts around town say ‘don’t look down’. I can’t do anything but. It still hasn’t sunk in that this is all real. The door opens as we arrive at the platform. The jump crew unclip my safety line and connect it to the pod, before I’m welcomed inside. 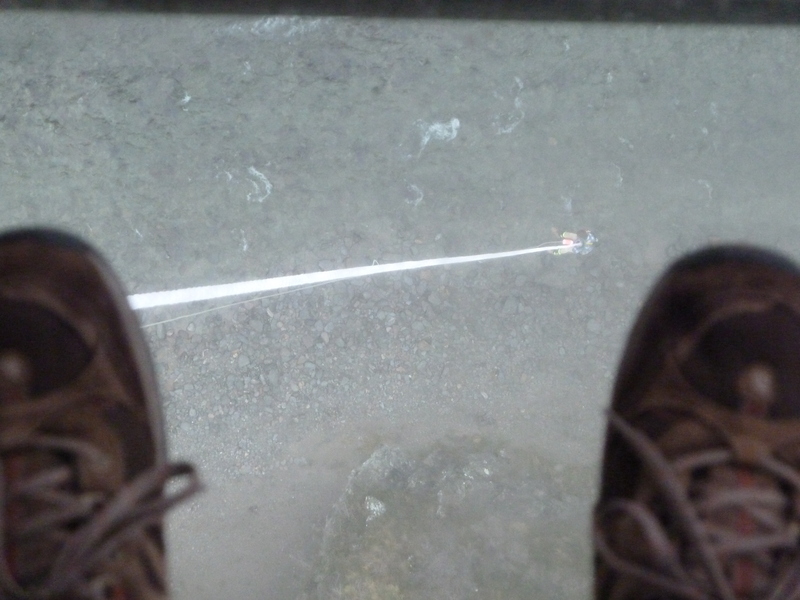 A glass floor provides yet another reminder of just how far I’m about to plummet. Somehow I’m selected as the first one to go. I know there’s no way back. Chicken out now, and I’d never live it down. 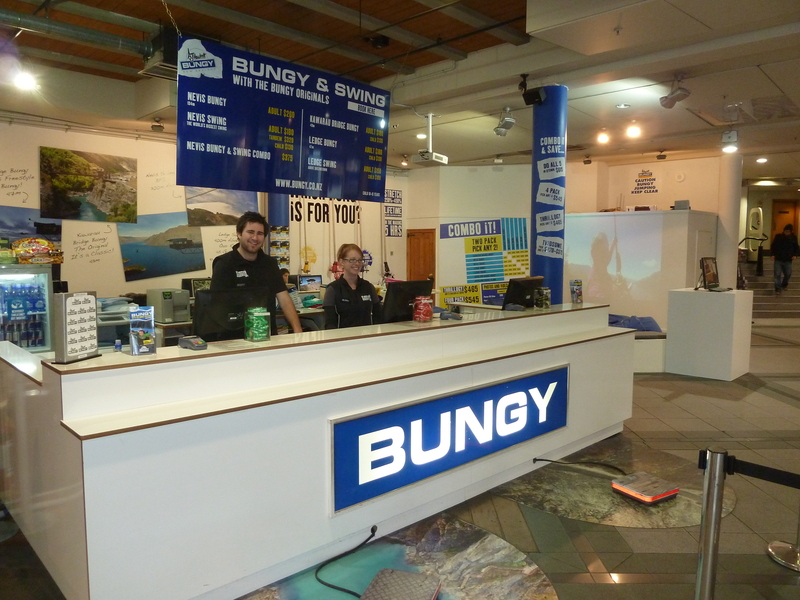 I had made a point of not broadcasting the fact I was signed up for a bungy, so that I didn’t have to put my hands up if I bailed. The only people i’d told, a couple of hours before, were my parents. “Don’t die,” my dad had reassuringly told me. Aside from the embarrassment, I would always be disappointed in myself. I’ve done a few fairly brave things through my work – flying with an aerobatics team, jumping from a lifeboat into the Humber, being winched up by a helicopter, that kind of thing – but this was a whole new ball game. “Just take a seat for me buddy,” I’m asked, before getting into a wobbly chair. My feet are raised and placed into holders, while two padded straps are placed around my ankles. My harness and clips are checked and double checked, which is reassuring. 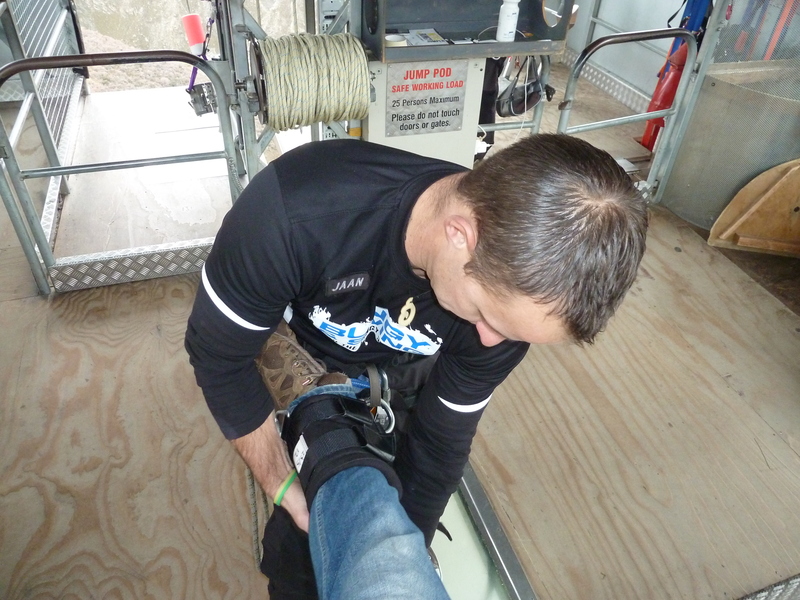 Then my feet are fastened together and attached to the bungy chord, that from now on is quite literally my lifeline. Slightly worse than the dentist chair! “Smile for the camera,” I’m told, before a flash above me. “You’re all set buddy, up you get,” I’m told. I can feel my heart pounding in my chest as I get to my feet. They’re buckled together, but I can still shuffle forward. “Keep going mate, keep moving,” I’m told by the crew, clearly keeping the motivation going to prevent any chance of me backing out. I shuffle onto the patterned steel pad that juts out from the pod. Its small, about the size of a small bath mat, and the bungy chord was moving around near my shin as I inched closer to the drop. There was a black line on the edge, and beyond, a straight fall to the bottom of the valley. I stood there, looking down against all the advice i’d been given, staring out and taking in the enormity of what I had to do. I was yet again asked to smile for the camera. Somehow, I mustered the most nervous smile you’ll probably ever see. By now, the palms of my hands were sweaty, despite the icy cold wind blowing through the mountains. My heart was pounding, with a strange sensation that I could feel it beating in my throat. I entered that weird tunnel vision sensation, where everything in the background is silenced. Below me, I can see the river winding around the valley. It’s some 30 metres wide down there, but from where I’m standing, it appears like a babbling stream. I look at the trees and rocks way down there. They look so small. There are no cars or people to give me any kind of perspective, but in a way that helps. I ask myself a question that has troubled me all morning. What am I doing? Somehow I have to jump from this, and its not just a little step. I’ve been told to leap out as if it was a dive into a swimming pool. I don’t even like doing that, and at most it’s a couple of metres. Somehow I’ve got to also keep my arms out stretched. From now on it was me, my thoughts, my search for courage and a fight against every human instinct I’ve been born with to somehow find it in me to jump. “Ok man, a big dive on one,” came a voice from behind me. I didn’t feel ready. It’s too early to go yet. Not yet. I can’t do it just now. Its too quick. I need to think. I hesitated. “Don’t wait around man, use my countdown,” I’m told. He’s right. The more I stand here, the more I’m going to think about it. I shuffled from side to side. Hesitate again, and there’s a chance I’ll back out. But it’s a leap into the unknown. Will the rebound throw me around? What does the acceleration feel like? Will I know if it goes wrong? “Three,” starts the count again behind me. This is it. Now or never. Deep breath. Focus. Look ahead. Arms out. From deep inside me, I let out a scream – a completely unintentional yell. A loud, fright-filled shout that filled and echoed around the valley. A noise I cannot recall ever making before. It was my body’s release. They say bungy jumping is all from the neck up. Right now, my brain thinks its all about to end. I feel the wind rushing around my body, my hair flapping around my head. I can feel the arc I have made through the air. I’m in freefall – a full eight seconds of freefall – as I hurtle towards the river that’s growing ever bigger in front of me. By now I’ve hit around 128km/hr and there’s no sign of slowing down. And then something clicked inside me. This wasn’t frightening anymore. It was an incredible feeling, one that suddenly I could enjoy. 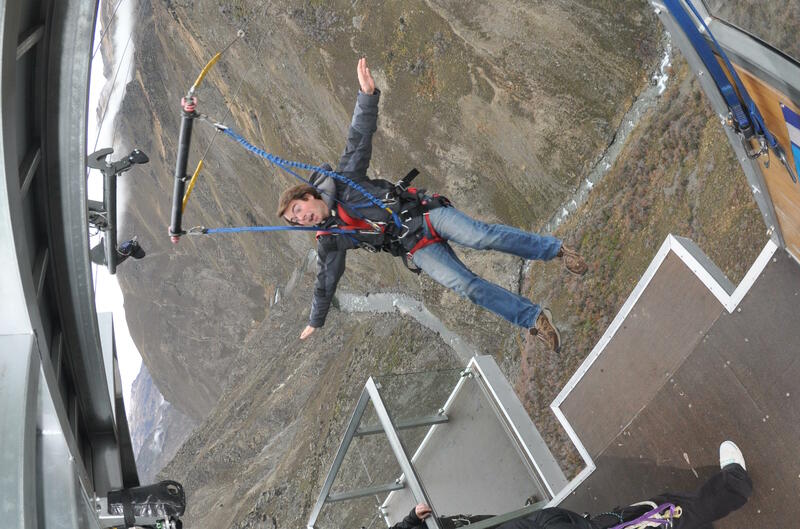 The adrenaline had kicked in, and this high speed, freefalling rush had hold of me. 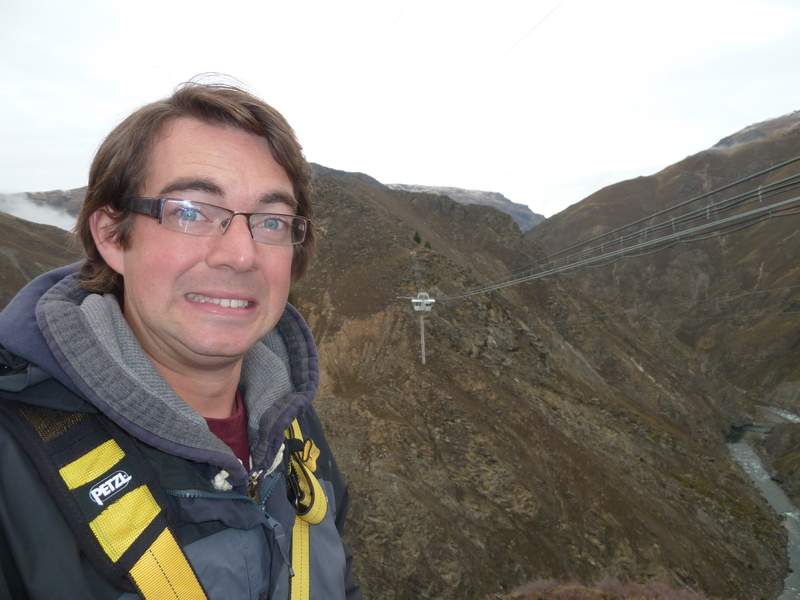 The valley sides were whizzing past by my head and I’m still looking straight down before I felt the gradual pull as the bungy chord trailing behind me starts to do its job. This was another part I’d been dreading – it can look so abrupt when the chord twangs you back up. Yet this was a gradual, enjoyable deceleration. The wind grew quieter, the speed and falling sensation slowed right down. And I’m going back up. “Yeaaaaaaaaaaaaaaaaahhhhhhhhh” I remember screaming out. I’d done it. I had faced my fear. And it felt incredible. I reached the top of the bounce, and once again I was on the way back down to earth. The speed and falling sensation picked up again. This time I could enjoy it. I knew I’d be fine. 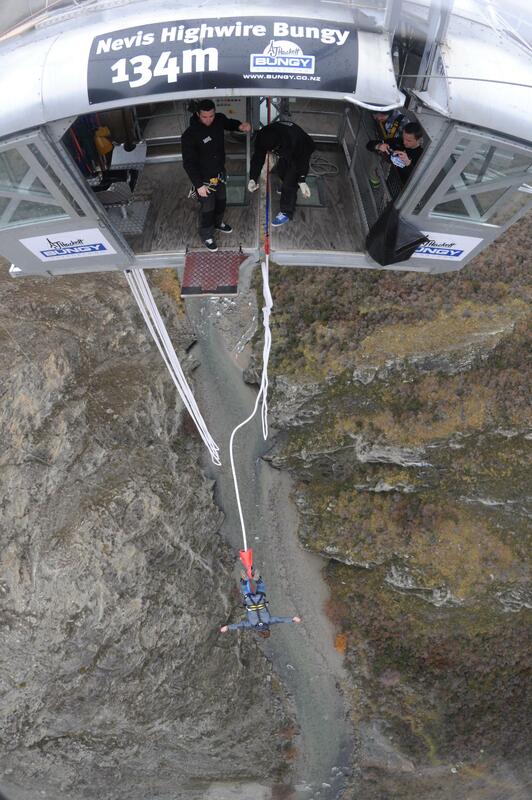 The second phase of the jump, surprisingly, has a greater fall than the first ever bungy from up at Kawarau Bridge. 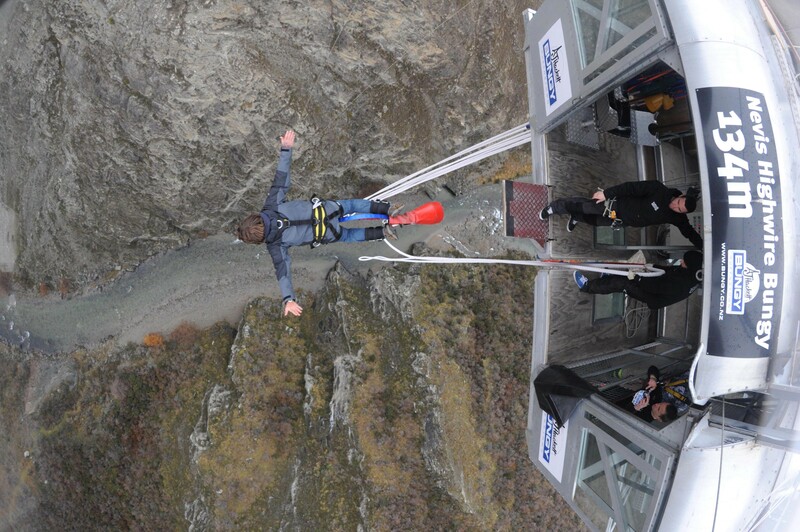 Its another bungy jump of its own. And it did feel like I was on the end of a giant elastic band. It’s a sensational feeling. Somehow I remembered that I had to release my legs at the top of the next bounce, by curling up and pulling a red chord from near my left calf. I saw it release the clips holding me upside down, itself a daunting prospect, and the jolt made it feel like I could fall free. Thankfully its all down to a brilliant design which means I could be winched back to the pod upright. I stayed still and soaked up what I had just done, taking in the scenery around me, laughing to myself with relief and with a giant smile on my face. I had pushed myself beyond a limit that I never thought I could do, yet somehow I achieved it. Back at the pod, it was nice to feel my feet safely back on the platform. “That was a real nice dive you did there mate. Was that your first time?” asked one of the team, handing me back my camera after getting a great shot of me jumping. I looked at the screen and couldn’t believe the person on it was me. I watched Dennis make his jump, marvelling at how he turned into a tiny dot 134 metres below me. On an adrenaline-fuelled high, there was one more task I had ahead of me. The Nevis Swing – the world’s largest swing. 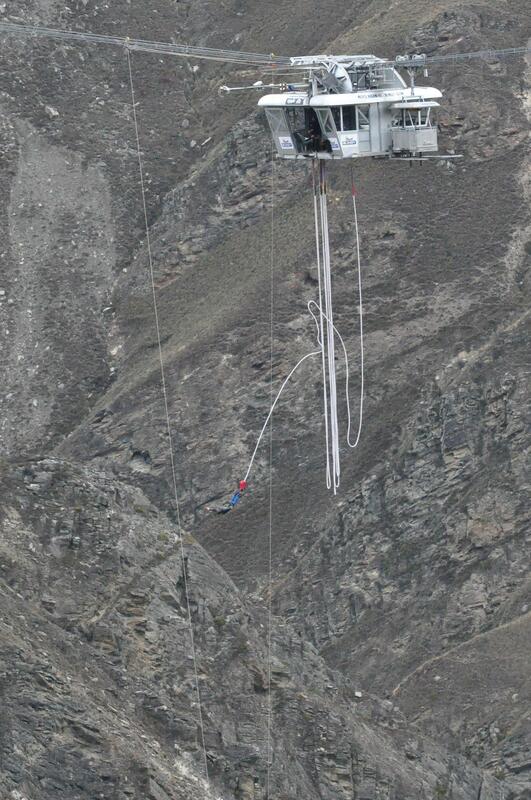 It launches you from one side of the Nevis Canyon to the other in a matter of seconds. 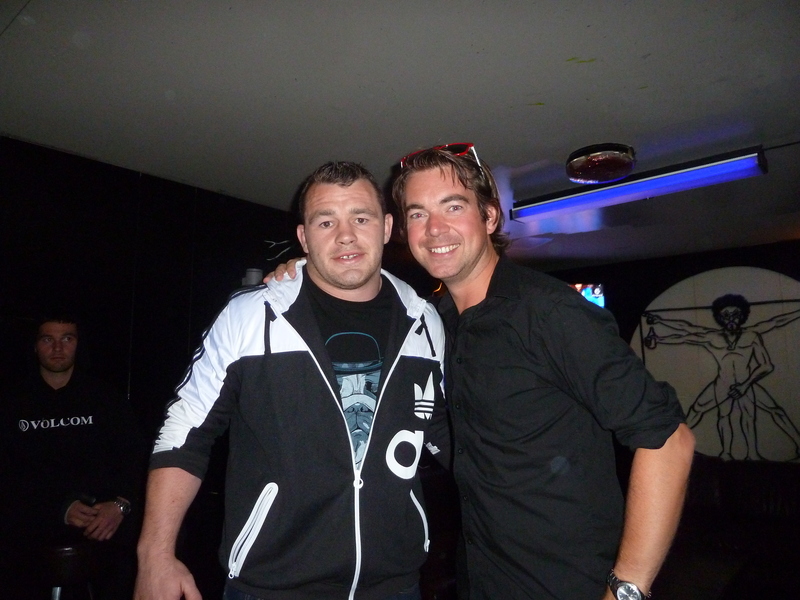 There was a crew of people eager to take me over to it, and I was led by Donal, from Kilkenny in Ireland. “My dad used to work in Grimsby, sorting peas,” he tells me. It really does seem you can go to any corner of the globe, and there will always be someone with a link to my home town! I was introduced to the swing operators, and asked how I wanted to go. 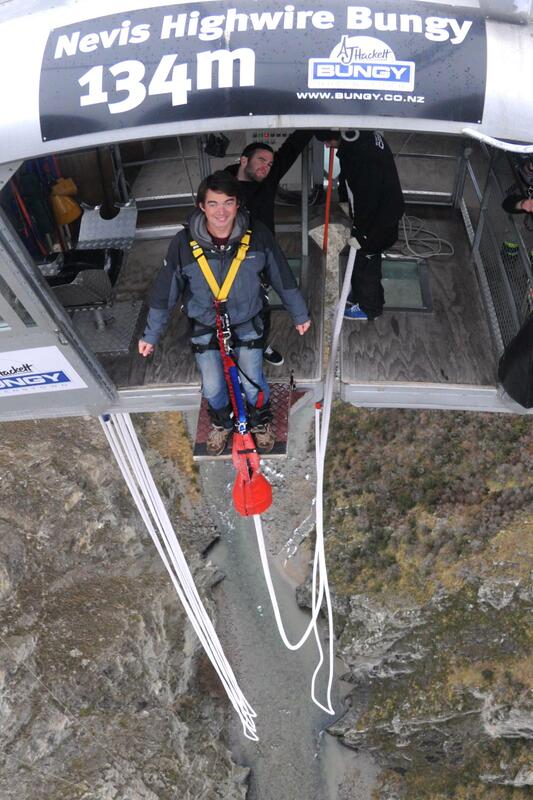 “You’ve done forwards on the bungy, you may as well do something different. Upside down? !” I’m asked. I might still be pumped up and have adrenaline blasting through my veins, but I wasn’t quite ready to go that far. “How about backwards, you’ll love it,” I’m asked. “Why not?” I laughed. Well, its something a bit different. The guys who spend their lives putting people through hell, all in the name of fun, love their jobs. “We see it all up here, laughs, tears, terror,” they joke. 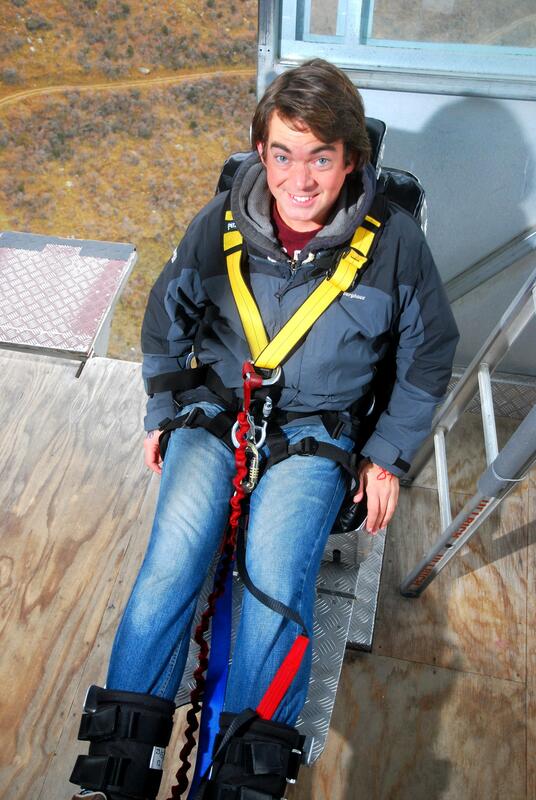 Strapped in, I’m winched over to the drop and told to let go of the ropes otherwise I could hurt my hands. “You need to put your arms out and keep them out,” says Jesse, who’s operating the swing. He engages me in conversation before secretly launching me mid-flow. I felt my face contort and heard laughter from the launch team which disappeared into the distance as I was sent tumbling through the air and in an arc across the canyon. 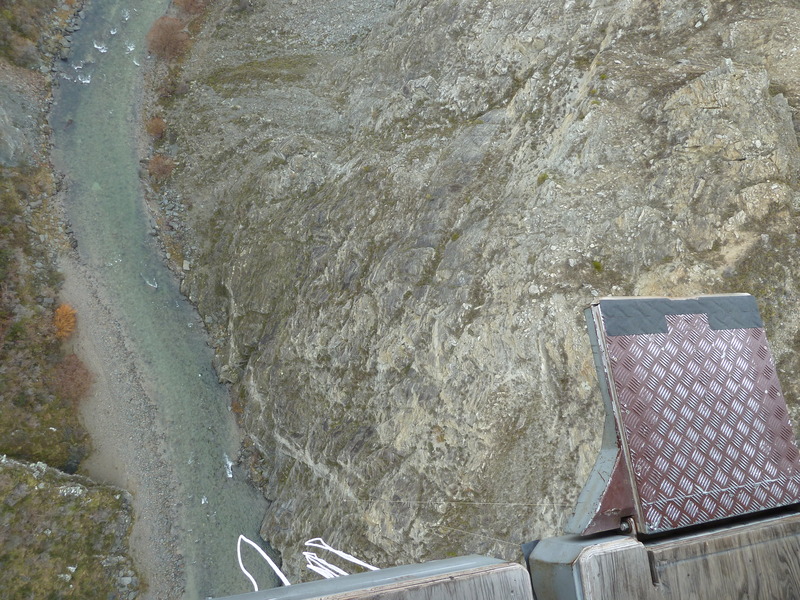 It was a different type of adrenaline rush, one that I could enjoy much more, but without the same level of personal achievement that you get from forcing yourself to jump from a ledge high above New Zealand’s southern alps. 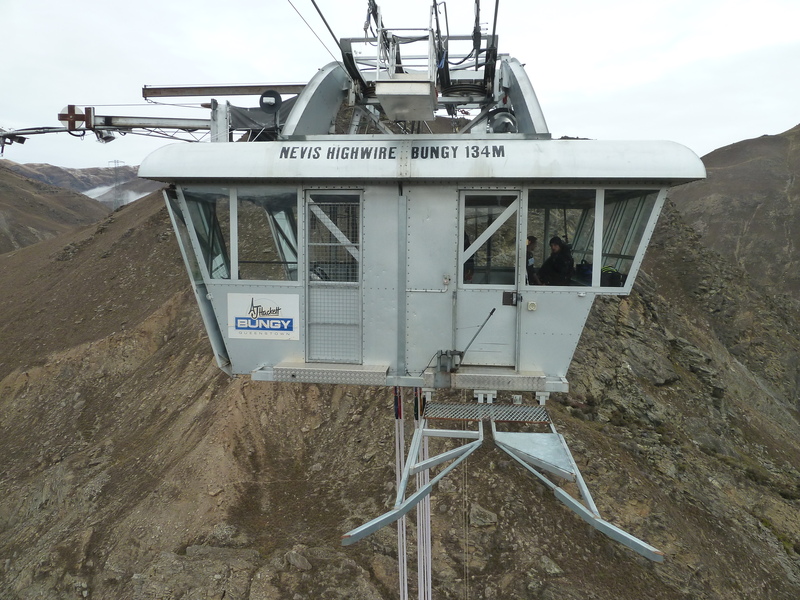 For that, there is only one thing to do – the Nevis bungy, but the faint hearted, while finding it daunting, I am sure would love the sensation of gliding through the air on the Nevis Swing. Its like the best tree swing you’ve ever been on, a playground swing built for adults. But both of them have one thing in common – the beauty of gravity. Today I learned that gravity can be fun to play with. I learned that falling from a great height can be strangely enjoyable. 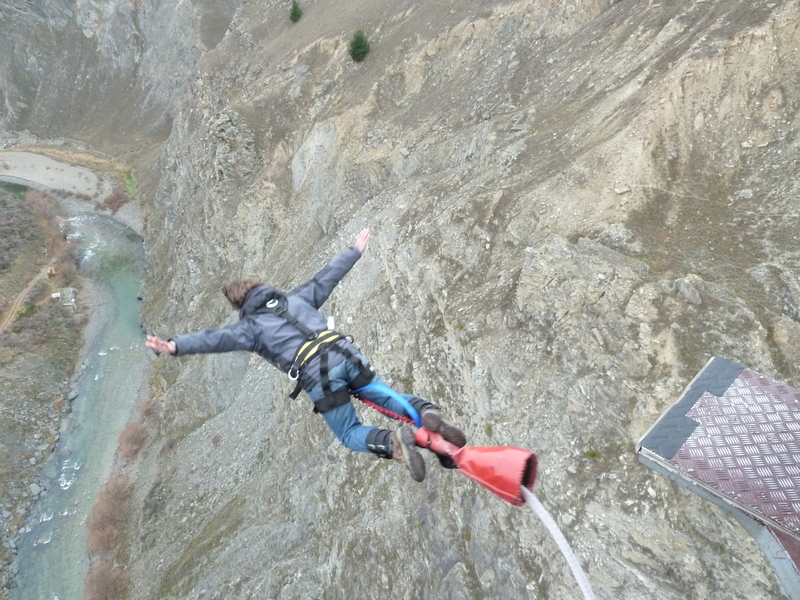 And I learned that had I not visited Queenstown, I would have lived my life without experiencing the awesome feeling of a Bungy. My life, from today, feels a little bit more complete. The Nevis Swing team. Cheers guys! 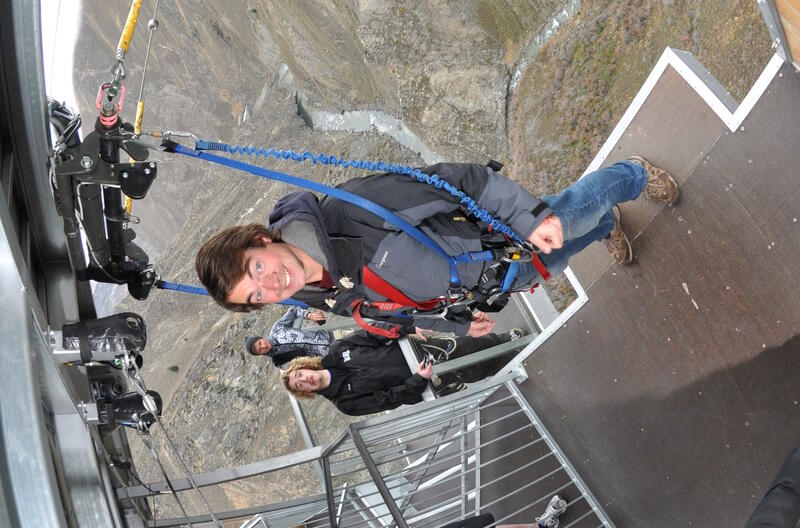 This entry was posted in Mountains, New Zealand, Travel and tagged adventure, afishoutofgrimsby, aj hackett, backpacking, bungy, bungy jump, fear, irish rugby team, magic bus, nevis bungy, nevis swing, New Zealand, phillip norton, queenstown, travel, travelling by afishoutofgrimsby. Bookmark the permalink. Great blog mate, thoroughly enjoyed the description of the jump! Thanks mate, got a few more things up my sleeve for this week too…watch this space, and thanks for the kind words. It was amazing! Wow Phil, you are crazy! Felt the fear just by reading this, imagine doing it for real?! Incredible! Hey mate loved that!!!! Queenstown is my favourite place so far!! Are you still there? I feel you should now do the endzone skydive to be honest!!!! Proud of you Phillip, fantastic write up.